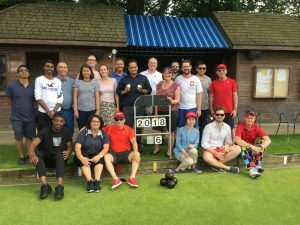 Stonebridge staff gathered for our annual Summer Party at the Toronto Cricket, Skating and Curling Club for a day of lawn bowling. With the Stonebridge Classic Cup once again up for grabs the competition was intense, with tight games and dramatic finishes. After an inspiring display of lawn bowling mastery the Cup was presented to John Estey and Cam Di Giorgio. Afterward the celebration continued at the Cricket, Skating and Curling Club patio with staff sharing their memorable moments of the event while enjoying cocktails and a delicious BBQ style dinner.